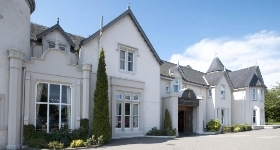 Kingsmills Hotel is a historic country house hotel in the centre of Inverness which offers a variety of short breaks in Inverness and the Highlands and is set in four acres of gardens. Click here for more information. The Ben Wyvis Hotel enjoys a commanding position looking over Strathpeffer. The relaxed air of the hotel gardens reflects the serenity of the location. Click here for more information. The Achility Hotel is an 18th-century inn offering bed and breakfast, free parking and free Wi-Fi in the Highland village of Contin. A traditional Scottish breakfast is served every morning, including local produce such as homemade jams and bread. Packed lunches are available on request. The bedrooms are individually decorated and all have a bathroom with a shower. The Achility is a 45-minute drive from Inverness and Inverness Airport. A warm, family welcome awaits at our traditional West Highland Inn/Small Hotel beautifully situated on the banks of Loch Linnhe. Stunning views across the loch to the entrance to the Great Glen and the mountains beyond. Twelve excellent en-suite bedrooms all with loch-views. Loch-view restaurant and bar. Residents lounge. Ideally located for Mull, Iona, Skye, Ben Nevis, Fort William, Ardnamurchan, Glencoe, Oban, Loch Ness and for touring the West Highlands. Situated on the shores of beautiful Loch Ewe, this 18th century, friendly hotel is the perfect location from which to enjoy the wonders of the north-west Highlands of Scotland. The Zetland Restaurant overlooking the Isle of Ewe offers the finest of service and traditional and local fare, specialising in seafood, highland beef and venison. Our comfortable lounge bar is perfect for a nightcap or try the public bar for a bit of 'local' atmosphere. During the day, relax in the conservatory or outside on the patio, overlooking the loch. Built in the 1700s, the Rowan Tree Country Hotel now offers elegant rooms, many with views of the mountains, Cairngorm National Park or Loch Alvie. Traditional Scottish breakfasts are available. All rooms have TVs, Wi-Fi and Egyptian cotton sheets. The en-suite bathrooms feature Duck Island toiletries and some have baths. The hotel has a lounge and bar, both with log fires in winter. The restaurant serves Scottish dishes, many using local ingredients and offers cooked breakfasts including porridge with whisky. This hotel offers a home away from home in the heart of the magnificent Scottish Highlands. Just a 20 minute drive from Inverness, set within historic Beauly, the Lovat is ideally located for fishing, walking, bird or monster watching, golf and sight seeing holidays. After a spent day exploring, the Strupag Brasserie or The Lairds Table restaurant awaits. Dishes are prepared from the finest local produce. After dinner, unwind in the foyer by the log fire and sample a malt or 2 from the extensive range of whiskies on offer. All our rooms come with all the features that will make your stay a real treat. The attitude of total flexibility at the Priory is one of its great features - early check-in, late check-out, breakfast until lunchtime and room service that will deliver anything from Champagne and smoked salmon to lager and pizza. The Priory is an ideal location for enjoying the unspoilt beauty of the North and West Highlands of Scotland. In Cairngorm National Park, The Boat Hotel has a 2 AA Rosette-awarded restaurant, Wi-Fi access and elegant rooms. Aviemore can be reached in 10 minutes by car. The Boat Hotel’s award-winning bistro serves fine Scottish produce, while the bar offers many fine malt whiskies. A full cooked breakfast is available in the morning. Room features include a monsoon shower, roll-top bath, DVD player and plasma-screen TV. Some rooms also have an outdoor terrace. Delightful hotel dating back to 1658, set in magnificent scenery on The Road to the Isles. Fully modernised and refurbished to a high standard. Award-winning 2AA Rosette Scottish cuisine. Friendly, personal service. "Slow down in the West Highlands". Award Winning Highland Inn in magnificent peaceful setting. AA Best Seafood Pub for Scotland 2005/6. Abbot Ale Perfect Pub for Scotland 2005/6. Where open fires and friendly people provide a warm welcome to all travellers to this spectacular region of The Highlands. The hotel is classic and fully refurbished with an eye to 21st century, there is WiFi access and yet the peace of a village and the style of a hunting lodge. We have one of the Highlands finest restaurants using crab and lobster from our own shores symbiotically fused with the wild game from the magnificent hills that surround our fabulous location. Situated enroute to the Orkney isles allowing a day trip to absorb the culture and sites yet returning to the log fire, fine food, Highland welcome and a dram before you retire to bed. The Kingsmills Hotel is only a 10 minute walk from the centre of Inverness and set in 4 acres of gardens with free car parking onsite. You will have full use of our leisure club which has a swimming pool, sauna, steam room, spa bath and gym. Within the grounds there is a 3 hole pitch and putt for you to enjoy. This 4-star hotel looks out over the River Ness and is 800 metres from Inverness city centre. It has an award-winning restaurant, a stylish cocktail bar, free parking and luxury rooms. The Glenmoriston Townhouse Hotel has a quiet location on the banks of the river. Some rooms have views of the river, and there is a garden for guests to relax in. The Contrast Brasserie offers fresh, modern food and the Abstract Restaurant has won 3 AA Rosettes for its superb seasonal cuisine. The Lovat is a luxury hotel overlooking Fort Augustus on Loch Ness in the Scottish Highlands. This award winning eco-friendly hotel offers warm and genuine hospitality, delivered by a devoted and passionate team. The Lovat has all the comforts of home, combined with modern facilities and stunning panoramic views. 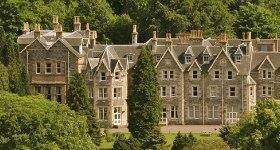 With a tranquil location in a highland forest, Craigdarroch House hotel has panoramic views of Loch Ness. There is free Wi-Fi. Craigdarroch House features elegant rooms, some with four-poster beds. The lounge bar houses a large malt whisky collection and an open log fire. With views over Loch Ness, the candle-lit restaurant serves a menu of local produce. Craigdarroch House is near Falls of Foyers waterfall, and has a conservatory where guests can watch wildlife. Within easy reach are Loch Ness cruises, golf courses and water sports facilities. The Tailrace Inn is situated in the centre of the scenic and historic village of Kinlochleven in the West Highlands of Scotland. Surrounded by the Mamore Mountains midway between Glencoe and Ben Nevis. It is an excellent base for walkers, climbers and those who enjoy outdoor activities. The Castle Arms Hotel is a former 19th Century coaching inn, situated 8 miles from John O'Groats, in the village of Mey. It is the nearest hotel to Gills Ferry to Orkney Isles, only a short distance from the Queen Mother's Highland home, the Castle of Mey. Set in 6 acres of open land adjacent to the North of Scotland's principal tourist route, it is ideally placed to cater for holidaymakers and travellers to Orkney. Dog friendly, with extensive dog walking possible. Nestling amidst the grandeur and majesty of the surrounding scenery, with the backdrop of the Ben Nevis range, is a gem of Scottish highland tradition. Fresh salmon, trout and lamb from Lochaber... typify the local produce that regularly features on the menu at the Stronlossit Hotel Restaurant. Delicious Highland fare is the order of the day, and the chefs at Stronlossit certainly know how to make the most of Scotland's natural larder. The Ben Wyvis Hotel, located in the beautiful and tranquil Ross-shire highlands enjoys a commanding position looking over Strathpeffer, much like the nearby mountain from which it takes it's name. The architecture of the hotel blends in perfectly with the village whilst the relaxed air of the hotel gardens reflects the serenity of the location. The Caledonian Hotel overlooks Ullapool harbour and the colourful fishing boats on Loch Broom. One of the oldest hotels in Ullapool, the Caledonian combines the character of a west highland hotel with modern facilities and standards. Ullapool is the ideal location for exploring the west Highlands including Loch Maree, Lochnivar, Gairloch, and the Corrieshalloch Gorge. The capital of the Highlands, Inverness, is under 2 hours away providing ample opportunity for shopping trips. With stunning views over the sound of Sleat and mainland mountains beyond, Duisdale House Hotel is perfectly positioned for exploring the romantic Isle of Skye. Built as a hunting lodge for the Clan Macdonald family in the 1860s, Duisdale sits in its own grounds of 30 acres which include lush, sleepy gardens and extensive ancient woodlands. The hotel itself has recently been completely refurbished and is now a stylish, contemporary, retreat. Welcome to Toravaig House Hotel and Restaurant on the beautiful Scottish Isle of Skye, the ultimate romantic retreat on Scotland’s own ‘paradise island’. Toravaig is a stylish, contemporary country house hotel situated in Sleat, the 'Garden of Skye' with magnificent views over the sea to the mainland hills beyond. Set in a 19th-century building, Sands Hotel is situated along the shore of Scapa Flow in Burray village. It has a bar, a restaurant and beautiful sea views. The hotel overlooks Burray Harbour and Watersound Bay. A general store and newspaper shop are a short walk away and Pentland Ferries terminal at St Margaret’s Hope is 4 miles away. All rooms at Sands have an en-suite bathroom and views of the beach. The Watersound Restaurant has a nautical theme and offers an à la carte menu with an emphasis on seafood. Scottish Country Inns is part of the Historic UK group of websites.